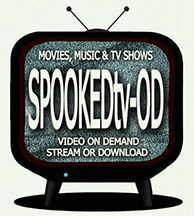 AS SEEN ON TELEVISION " THE SCI FI CHANNEL "
'SPOOKED' NOW ON DVD "SPECIAL CLASSIFIED EDITION" OUR PRICE ONLY - $13.95 plus shipping & handling. (tax if applicable) (IN STOCK-Ships within 24 hrs) Click on the BUY NOW ICON on the right side of this page. 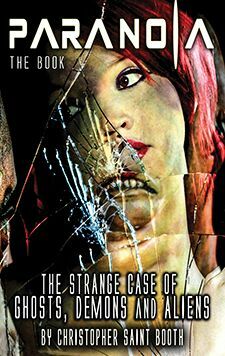 "WITNESS WHAT SCI FI COULD NOT SHOW YOU" UNCUT & RAW DVD PACKED WTH BONUS FEATURES * MORE PATIENT INTERVIEWS - MORE DISEASE - MORE GHOST HUNTS - MORE MADNESS - EXCLUSIVE SCENES includes the THE BONE DUMP, TUNNEL SPIRITS, THE WHITE DOG & MUCH MORE! THE WHITE DEATH and its barbaric operational procedures. THE FIVE FLOORS: (separate chapters) An exclusive tour and walk through the fiver floors of WAVERLY HILLS SANATORIUM. Exclusive Video, Stills, Voice over, Text, Narration and rare interviews from former patients and employees guide us as we explore this monster of a building. THE HAUNTING; The real ghosts, (captured on night vision video and stills including EVP's and eye witness to these paranormal sightings. THE DRAINING ROOM: Slit from throat to groin in desperation to drain the disease. THE DEATH TUNNEL: Explore and experience the REAL DEATH TUNNEL. Chasing Ghosts - Featurette and much more. The most eye opening ghost documentary ever produced: includes video, stills and audio footage of paranormal sightings: EVPS, ORBS, SHADOW PEOPLE, APPARITIONS, IMPS and GHOULS. IF YOU DON’T BELIEVE IN GHOSTS YOU WILL NOW!!!! click on the BUY NOW icon on the right side of this page. ORDER BY MAIL: Please allow 10 days delivery. 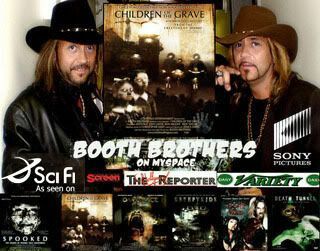 BOOTH BROTHERS at AFM 2006 show a sneak preview of their NEW titles. The American Film Market provides unprecedented potential for every Attendee. In just eight days, more than $800 million in deals will be sealed - on both completed films and those that haven't started shooting yet. Join over 8,000 industry leaders in Santa Monica for eight days of deal-making, screenings, seminars, networking and parties and discover the destination that has launched thousands of films. 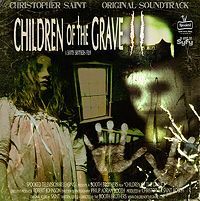 SPOOKED, DARKPLACE and CHILDREN OF THE DAMNED at AFM 2006. The Largest Film Industry Event in North America.